Sometimes style and function are born out of practicality. When it comes to dishes, I have used everything from the indestructible Corelle dinnerware to fine china. I have always felt like service for six was sufficient as we are a family of four. Without fail, however, pieces went missing like socks in the laundry. They were broken, ended up under my son's bed or even went out the door transporting brownies to a neighbor. Finding replacements was always a chore and often meant buying another set. While browsing around in Crate & Barrel, I came across a set of white stoneware dishes in a casual cafe style that I loved. Be honest, it all comes down to the bowls. You need a cereal bowl that isn't cavernous and a soup bowl that isn't shallow and all rim! I started from square one again, bought a full set, and got rid of my remnants. These dishes have been great; I think white makes the best canvas for food. After a few years, though, my inventory began to dwindle. I immediately went back to Crate & Barrel to buy more only to find that they were discontinued but might still be available in their outlet store. Oh you know I Googled the nearest outlet and rushed over. Luckily, they had them and I bought another set, service for twelve this time. At last, I could relax as I had a substantial stash of replacements stored in the basement. That was five years ago and I have since made a serious dent in my stash. 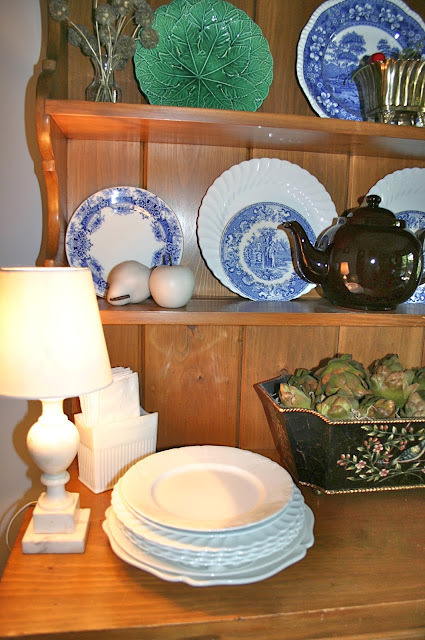 Not long ago, while organizing and rearranging my kitchen hutch, I pulled out what was left of a white ironstone set of dishes given to me by my mother as part of a hope chest before I got married. 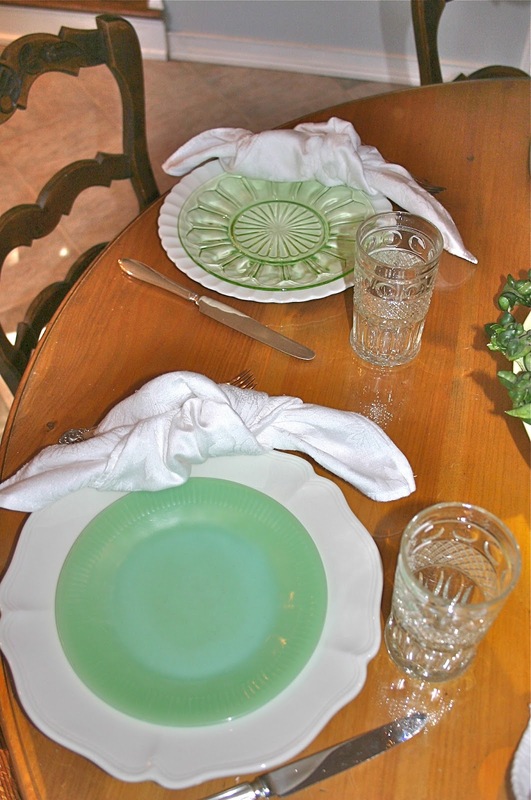 I love these dishes and decided there was no reason why I couldn't use them along with my Crate & Barrel stoneware. Since then, I keep my eye out for white dishes at flea markets or tag sales to add to my mismatched collection. I don't worry about the diameter or pattern as long as they are white. I now have a stack of pretty white dishes on my hutch to supplement those Crate & Barrel favorites in the cabinet and my table has charm.